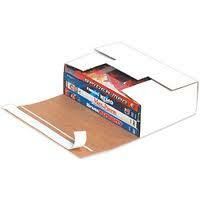 Strong corrugated mailers protect DVDs during shipment. Mailers are constructed from 200#/ECT-32 white corrugated. One piece mailer folds together in seconds without tape or glue. Sold and shipped flat in bundle quantities.